During his junior and senior years of high school, Stephen King wrote his first novel. Titled Rage, it was a novel about a troubled high schooler and his abusive father, adolescent angst, and fixation on a schoolmate bully. When the protagonist is expelled from school, he returns to shoot and kill his algebra teacher and take his class hostage. While the class is being held hostage, a “psychological inversion” occurs wherein the class grows to see the bully as the villain rather than the protagonist. Keep in mind this was written in 1964, decades before school shootings were a thing. To me, this part of Stephen King’s past puts him in a unique position to make insightful commentary on the subject. 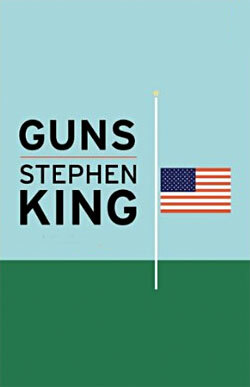 This essay, another Kindle Single, is Stephen King sharing his personal thoughts on gun control. Unlike More Guns, Less Crime by John Lott this is not a substantiated argument backed by evidence, it is something of an opinionated rant. However, a rant by Stephen King holds weight due to his unique history with the subject matter. Also, he is Stephen King. Although he’s an outspoken liberal, Stephen King is a gun owner. He understands the true nature of gun control, as most actual gun owners do, but believes that semi-automatic weapons can only be used to promote violence and should be banned. There are many obvious counter-points to his assertions but these aren’t addressed, perhaps due to the brevity of this essay. Because of this, it felt like an incomplete argument, but that could be because I judge Guns in the context of More Guns, Less Crime which I also read recently. Guns is a superficial look at the issue while John Lott’s book is a deep dive into the actual facts and figures. As you’d expect, this book is written exceptionally well. However I feel that if you’re going to address the issue of gun control in a published work, you have a responsibility to to address all angles of the argument to do the subject matter justice. Guns by Stephen King doesn’t quite meet that standard.